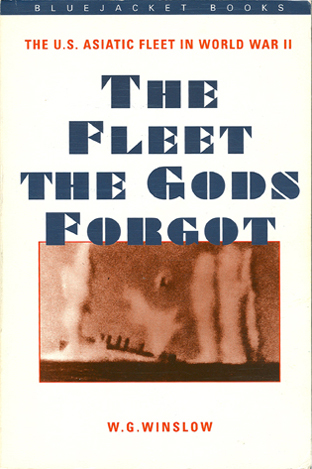 “The FLEET The GODS FORGOT” The U.S. Asiatic Fleet in World War II. By Captain W.G. Winslow, USN (Ret.). Foreword by Rear Admiral Kemp Tolley, USN, (Ret.). 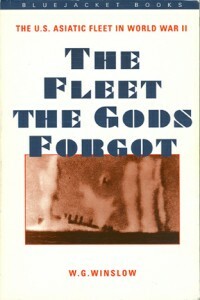 This is the tragic and heroic story of the demise of the U.S. Asiatic Fleet at the outbreak of the World War II as told by a naval aviator who was aboard the fleet’s flagship, the USS Houston (CA-30). Captain Winslow’s graphic description of the battle at Balikpapan, Java Sea, and Sunda Strait and his intimate portrayals of the men who commanded these operations bring the engagements back to life. In early 1942 just a handful of U.S. war ships were all that stood between the Japanese and the Philippines. Winslow tells of the tragic American losses, including the cruiser USS Houston, the destroyer USS Peary (DD-226), American submarine USS Perch (SS-176) and many others. 1994 Softbound edition, 327 pages, 25 black and white photos, 1 map, appendix and an index. USS Houston and USS Perch wrecks found!